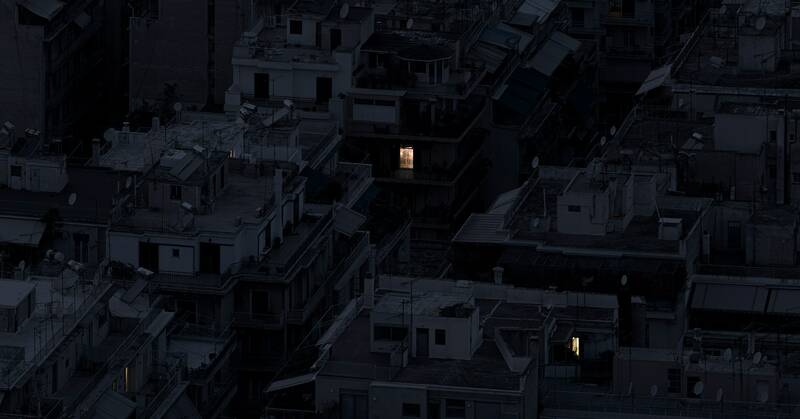 For his latest photography project, Roufanis decided to tackle the problem of urban loneliness head-on. Each work in the series Alone Together comprises hundreds or even thousands of individual photographs that Roufanis took of cities at night, then digitally stitched together into immersive, large-scale panoramas. For each city Roufanis photographed—London, Paris, Athens, Hong Kong, and Mexico City—he chose a high-altitude vantage point and spent all night there, shooting images of the cityscape with Hasselblad and Sony A7 digital cameras. Back in his studio, he used software programs PTGui and Autopano Giga to assemble the original photographs into the final composition, a process that took up to six months per work. The resulting images have extraordinarily high resolution—the largest are eight gigapixels wide and take up hundreds of gigabytes of memory. Roufanis uses his own large-format printer to print the works, since “very few labs in the world are willing to spend that much time with you.” Most of the photographs in the series are displayed in 10-foot-wide prints, although because of their high resolution they could technically be printed at 10 times that size. The images are nearly all-black except for the dozens of lighted windows scattered throughout the urban landscapes, evidence of tenuous human activity amid the darkened office blocks and apartment towers. Often, the people or objects inside the lighted windows suggest a narrative—the images repay the viewer’s close attention, especially at full size.